Siggi’s yogurt has done what I only dreamed could happen. They made a flavored yogurt with only the fruit as the sweetener. 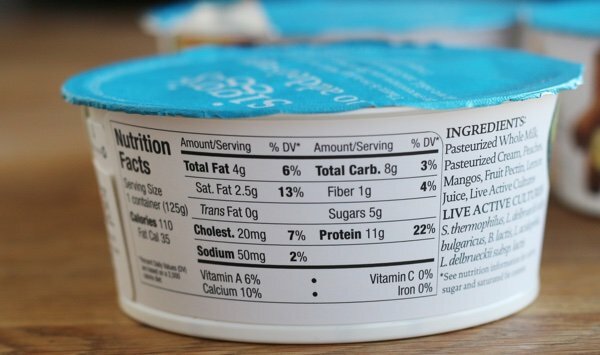 Siggi didn’t add aspartame, stevia, or any artificial sweetener as a way to make the yogurt sweet. I have been begging companies to stop adding sugar for a long time. They make the mistake of bringing me in to show me their products and then I lecture them on sugar. Ask General Mills and Chobani how much fun I am. I am pretty sure Chobani has stopped speaking to me. Siggi’s yogurt has invited me to breakfast for three years in a row and I have never had the time to go lecture Siggi Hilmarsson on sugar. He is a real person whose name is really Siggi and he created a product that I have been waiting for (without my lecture!). He didn’t even add fruit juice concentrate (another form of sugar)!! 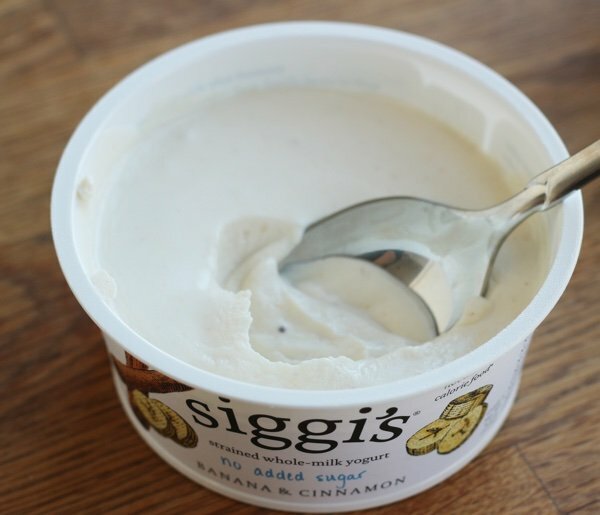 I happen to like the sugar added flavors of Siggi’s – read about them here: Siggi’s yogurt review. 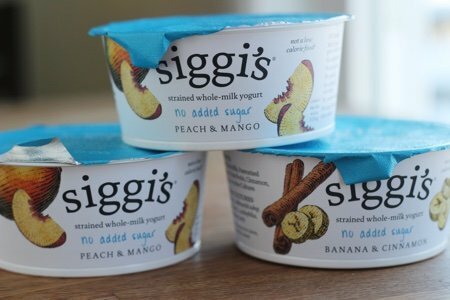 So far, Siggi has debuted two flavors with no added sugar – banana cinnamon and peach mango. How do they taste? Well, if you are used to yogurt that is packed with sugar, these will taste very sour to you. Now I know why Chobani and General Mills think I am crazy for asking for no sugar to be added to their products. Who is going to like it? At first, for me, the flavor was very disconcerting and then I started to love it. The consistency is thick and creamy – quite luxurious. The fruit flavor is subtle and melds with the yogurt flavor instead of overpowering it. You have to really like YOGURT to like this product (not the dessert item that many companies call yogurt). As you can see it has 110 calories and 5 grams of sugar per serving which is due to the natural sugar found in fruit and yogurt. The container has 4 Smart Points for those Weight Watchers members in my audience. 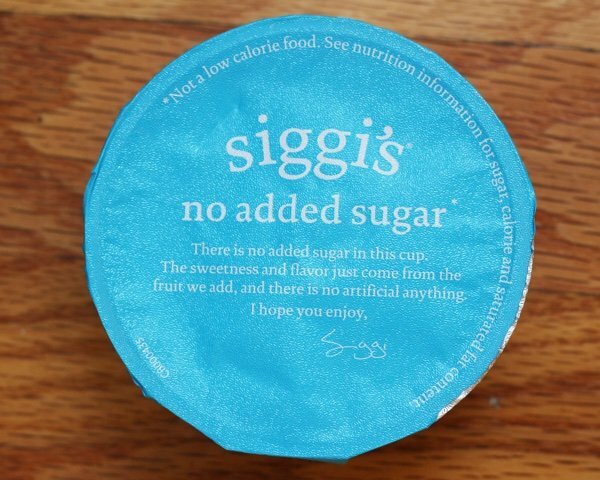 You can find Siggi’s 4% No Sugar Added using this Siggi’s Location Finder. I found it at my local Whole Foods but not at my regular supermarket. Hopefully, it will show up there. I have some potentially bad news about Siggi’s yogurt. The company was recently bought by a large European company called Lactilis. Why is this bad news? It seems that every time a small manufacturer with a great product gets bought by an enormous conglomerate – Stonyfield I am looking at you- the product goes downhill. They change it, ruin it, or stop making my favorite products. It is such a bummer to find something you like only to discover that it has been discontinued due to some product manager who only cares about big profits. Please, Siggi, invite me to breakfast again so I can lecture you on how big companies like to squeeze profits from their subsidiaries by taking shortcuts. We can eat your new yogurt together as we kiss it goodbye because it is so different and strange to American tastebuds that it won’t be popular enough to remain in your product line. Perhaps I am being too dark – but get it while you can!! Woohooo!!! What great news that someone is finally offering a real YOGURT that isn’t a dessert concoction we call yogurt! I can’t wait to try it. I’m sure it will take some getting used to for my kids, but we all need to get back into discovering what real food tastes like! Good for you, Siggi!! High five for Siggi's! I just added to my grocery list and am praying I can find it here in Charlotte. So very excited to try it!!! Great news but I am with you on that fact that when a company gets bought out the recipe could change and usually not for the better. In the meantime I will be looking for this and I was just at Whole Foods last night! This is so great!!! I hope the market responds. I think a lot of people who buy plain and add fruit will come out of the woodwork for this. It is a whole different food and so yummy. I hope the buy-out doesn’t kill it. For someone who only eats unflavored yogurt and adds real fruit, i am ecstatic to hear this! what a treat!! I will make a special trip to buy this, just to say thank you!!! Me too! Thanks Siggi. I LOVE plain yogurt, especially yours. Now with fruit, but no added sugar, I can't wait to buy lots of it! I make my own concoction with plain yogurt, a teaspoon of my favorite preserves (Bonne Maman Four Fruit Preserves) and puffed quinoa for crunch. I love it and it is what I am using to gradually do away with too much sugar at night. The Bonne Maman has many different flavors and can be found at Walmart and other grocery stores like Meijer. The Cherry is the best I've ever tried and that is what I buy if I can't find the Four Fruits. The puffed quinoa can be used instead of croutons in Caesar Salad. It isn't flavored but takes on whatever you use it with. Carrington Farms sells the puffed quinoa. My 6 yr old grandson likes this better than the ones that are marketed for kids. I hope someone will try this. When packages of yogurt were first sold, back in the 1950's or maybe the '60's, (I was a little kid, don't recall how old I was) it was real yogurt. No sugar! Tart, creamy, absolutely wonderful! We loved it, we gobbled it up, and I stopped buying yogurt in a box when they started messing it up with sugar, starch, Splenda, Aspartane, etc. I make my own, have done for years. For my started I used Dannon Plain Lowfat, which is actually yogurt. Publix brand costs less, but they add food starch, and I just want basic yogurt. It's so remarkably simple to make, using a microwave, a big jar, starter, and milk. I use 2% milk. Not as thick as with food starch, but the whey can then bake bread or biscuits. If I don't feel like making it, back to get more Dannon. Diane, I would love it if you could share your recipe. I have tried making Vietnamese yogurt in the crockpot but wasn't satisfied with how it turned out. But the microwave? That would be super! What makes Greek yogurt "Greek yogurt"? How does this compare? Do they make it in a low-fat or no-fat variety? I have recently discovered that I am lactose-intolerant and can occasionally tolerate greek yogurt. But I would also like to avoid the sugar. Oikos Triple Zero tastes great but the after effects on my stomach due to the type of sweetner they use, stopped me from buying it. Make your own and you will always have a supply and have control over the ingredients. You can buy a yogurt maker or buy a warming mat used for seedlings to set your jar on. Or, do what I did for years until I got a yogurt maker and just put your jar of yogurt in your oven with the light on overnight. The longer you leave the thicker it will be. You can buy yogurt starter that is thermophilic (requires heat). This mean you can make yogurt on your counter top without heat. It is called mesophilic (does not require heat). Or, I bought Fage yogurt for a starter. Fage, by the way is delicious yogurt and makes a great starter. Here is a link to a CulturesforHealth.com on how to make mesophilic yogurt. The website has many other cultures for making yogurt as well. Sue, the puffed quinoa is manufactured by Carrington Farms. I bought it directly from them online. But you can also get it at Amazon and other places. I would love to try it where can I buy it.